Are you a huge Rock River Yamaha Race Team fan? Do you wish you had the chance to race with the pros on one of their decked out bikes? While racing with these athletes may be a dream, having a bike that looks like one of their custom beauties doesn’t have to be. Roost Motocross Graphics has introduced several new decal designs for your bike, completely customizable to the make, size, and model of your dirt bike. The kits cover everything from rear fenders to fork guards, and come equipped with the most durable vinyl to protect your bike’s designs from wear and tear. Each kit is available for both motocross and supercross bikes, and are able to be fully personalized to your style and preferences, with 9 background and number color options and three optional add-on Radiator Louver graphics. The best part? 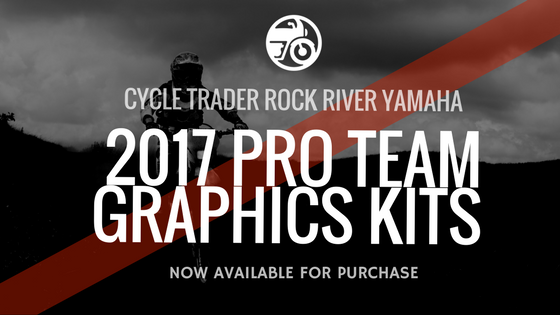 You can even add a 2017 Cycle Trader Rock River Yamaha Pro Team T-Shirt to your order for under 8 bucks. Use the coupon code CT15 at checkout, and receive 25% off your graphics purchase! Get your bike styled up for this race season, and you’ll be repping the Rock River team like no other. Here's a guide on education system in latin america for you guys. Check it out!